This is a belated blog but better late than never. I had the privilege of travelling to Ghana with Michael, Sarah, Chris and Christian. It was a tremendous experience, one we will remember for a very long time. 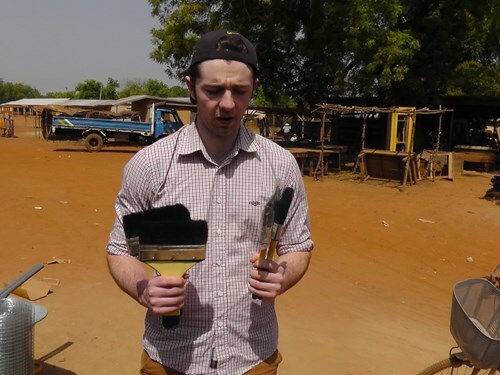 On the flight up to Tamale, I handed the team a challenge which required them to purchase a tin of paint and paint brushes on the journey from the airport to the Kings village. It was a great experience for all and during the week we spent a morning painting the nutrition centre. The overall purpose of the expedition was to assess the needs and develop a case for support for a response to an area north of the Volta River. We visited this area, with Ann and Terry Carpenter, twice in the week and to say that it is remote and difficult to access, is an understatement. We travelled for 40 min in a car from the Kings village to the river, crossed the river by boat and then spent between 45 minutes to an hour getting to Singa, the first village. Toligu and Gbali were a lot further inland. We were warmly received and the Chiefs and elders expressed their gratitude that we would even consider coming to help them. The short to medium term plan is to renovate and staff the local clinic in Singa and help the community build soak-aways to reduce deaths caused by malaria. Our long term goal is to help strengthen the education provision for the children. In Toligu the school is under a tree and all 175 children in the village are in the same class. Until last year, when Operation Orphan empowered a teacher to move to the village, none of these children had been to school. In addition to these excursions, we spent time understanding the work of the Kings Village. We were introduced to the Medical Centre, Kings School, Nutrition Centre and the community water and sanitation program. The work that this dedicated team do is highly effective and gratefully accepted and accessed by the local villages. Since then Sarah and Christian have completed the three peaks challenge to raise money for this project and Michael has involved an architect he knows to help in the design of the clinic and maternity wing. Another expedition is being planned for January 2014 where the team will help build soak-aways designed to reduce the amount of stagnant water around their homes and therefore reduce the number of cases of Malaria. Please email globalexpeditions@operation-orphan.org if you are interested in being part of this team.